Can't Sleep? Try our hypnosis, sleep therapy, and your sleeping problems will be relieved. Hypnotherapy Solutions For Life ™ introduces cutting edge hypnosis. brain entrainment, and specially designed sleep music designed to effectively solve many sleeping problems. Includes free bonus. Wouldn't you like to be able to sleep well?" The ability to sleep well enables us to handle our problems with more ease and success. But for many, a good night's sleep is just a "dream". So many people have sleep disorders or sleep problems that cause them trouble sleeping. You may have tried melatonin sleep products, prescription sleep aids, read sleep tips on every site and researched every kind of sleep disorder.But if your problem is not physical, this site may truly show you how you can sleep more effectively! 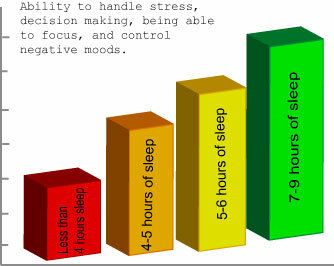 DID YOU KNOW THAT YOUR LACK OF SLEEP CAN SABOTAGE YOUR EFFORTS TO IMPROVE YOURSELF? Decades of research have documented the debilitating effects of poor or dysfunctional sleep patterns. Your sleep health can directly effect your physical health. Everything from personality disorders, weight gain, poor judgment, and slower reflexes - lack of sleep seems to be the culprit. "A growing body of scientific evidence suggests that too little or erratic sleep may be taking an unappreciated toll on Americans' health." ~~ Washington Post. Your success at work, in relationships, and at home could increase dramatically by training yourself to get better sleep during the night! Sleeping is not something you can do without. But you want natural sleep, not drug induced sleeping. We've developed a product that is a natural sleep help that goes further to actually train you to wake up in the morning, refreshed after a better sleep than you've had in years! We know you want to be able to handle life, change, and growth in a positive way. But it's so difficult when you are exhausted and tired. But when you get enough sleep, tasks are easier, and life just seems better. How much sleep do you get each night, and how much should you be getting? How many times do you wake up in the middle of the night saying, "I cant sleep! I have trouble sleeping! I need a sleep aid or some sleeping tips!" Includes "INSOMNIA NO MORE" and "STRESS ELIMINATOR " Hypnotherapy CDs and "SOMNIS" bedtime sleep music. Experienced Hypnotist - Tim Brunson, PhD has over 15 yrs of experience. Listen to sample here. Brain Entrainment - Added power - brain entrainment feature for optimal hypnosis success. * The brain entrainment feature used during the "Insomnia No More!" session is designed to allow the "better sleeping" suggestions to firmly take hold. The entrainment used with the sleep music is designed to gently 'entrain' your brainwaves to those associated with sleeping (delta). Beautiful "SOMNIS" Music CD - The sleep music slows from 70 beats per minute (bpm) to 40 bpm in order to gently coax you to sleep. Designed for use at bedtime. 36 minutes. Two versions included - one with brain entrainment (helps brainwaves move from beta to delta/sleep - Listen here) and one without (Listen here). These samples are taken at different parts of the music. *99% of population respond extremely well to this technology. However, it is not recommended for pregnant women, people prone to seizures and children under 18. Careful experiments by psychologist David Dinges* and others have shown that people who get less than 8 hours of sleep per night show pronounced cognitive and physiological deficits, including memory impairments, a reduced ability to make decisions, and dramatic lapses in attention. As sleep deprivation continues over time, these deficits only grow worse. Millions of people all over the world struggle with sleep deficit and poor sleeping habits. What would you do to get a good night's sleep? According to the National Sleep Foundation, the annual cost in lost worker productivity due to sleeplessness is about $18 billion dollars. Annie Brunson, an award winning composer, has worked with her husband to create beautiful scores and music for hypnotherapists all around the world. The sleep music CD,"SOMNIS", is designed to gently lull the listener to sleep. The brain entrainment version is designed for use with or without headphones for a more comfortable listening experience. What are other professionals saying about hypnosis tracks written and voiced by Tim Brunson, PhD? "I let myself experience the imagery, the ebb and tide of your voice. It was so easy to *be* there! As I truly love nature and am at one with it, I can always achieve the experience fully having, in reality, experienced a great deal of much of what the world has to offer in the natural world. -- I definitely experienced a feeling of well-being during and after." "The relaxation session for Insomnia No More is wonderful. I am enjoying the benefit of these 20 minute breaks during the day and will continue with these sessions indefinitely. As advertised, I am falling asleep quickly and deeply - sleep comes more easily than it has for several years. I use the Somnis music tape at night and rarely hear more than a few minutes of the 35 minute session before falling asleep. Thanks for this. It really works." Dr. Tim has a unique style of hypnosis that is extremely effective. He's spent years studying and developing Advanced Neuro-Noetic Hypnosis ™, and perfecting the scripts he uses in his products. He has a PhD in Clinical Hypnotherapy and is a Master Practitioner and certified Trainer of Neuro-Linguistic Programming. "Wouldn't you like to begin safely training yourself to sleep well tonight? " Much sleep research has recognized the effectiveness of hypnosis. Hypnosis is safe and natural. Unlike prescription sleep products with the accompanying danger of addiction, the result of hypnosis is refreshing, un-medicated sleep. As you keep listening to the session over a period of at least 21 days, you'll notice that your sleep health improves, and problems sleeping just disolve away. Hypnosis will help you re-program your unhealthy sleep patterns over the next few weeks. Each night you'll find it easier and easier to fall and remain asleep. Using the hypnosis sessions during the day or before bedtime and the bedtime sleep music with brainwaves while falling asleep, you'll have the tools you need to conquer insomnia and start living a fuller, more vibrant life. "Many insomniacs say they would do anything to get a good night's sleep! They can't take another sleepless night with no sleep. How do you think you'll feel with a great night's sleep? " How do you think you'll feel once you'll be able to sleep restfully and start regaining health you may have lost through insomnia? What if you were no longer sleep deprived, but alert, focused and able to get so much accomplished during each day! We want to bet that you'll be more able to successfully address self-improvement issues, have more fun in life, and generally feel better than you have in ages. "Get the sleep you need!" SPECIAL OFFER: Order by May 04, 2019 and you'll get "Insomnia No More" and "Stress Eliminator" hypnotherapy sessions, "Somnis" bedtime sleep music without brain entrainment, and "Somnis" bedtime sleep music with the powerful brain entrainment feature. PLUS, if you order soon, we'll also include a valuable FREE BONUS! Highly effective "sleep better" pre-sleep tapping session. This 7 minute audio takes the listener through 3 rounds of tapping inspired by EFT. To be used just before sleep and before the SOMNIS sleep music track. Listen to sample here. But only if you order soon! We also have Weight Loss and Stop Smoking packages as well as single sleep hypnosis products. If you are serious about sleeping better, you may also be interested in the emWave® Solution for Better Sleep. This portable and easy-to-use device is a drug-free and simple way to reset your body's natural rhythms so that you can sleep deeply again night after night. Developed from the Institute of HeartMath's 16 years of research on the relationship between the heart, brain, stress and emotions, emWave is both innovative and practical. It enhances your life through it scientifically-validated technology and is used by health professionals worldwide. Use it in conjunction with our hypnosis sleep package to get the best sleep you've had in years! After ordering our sleep package, come back here to order the emwave. P.S. Brain entrainment is a very powerful technology. It should not be used by pregnant women, people who suffer from seizures, and children under 18. The brain entrainment version of the bedtime sleep music is designed to be used with or without headphones and should not be used on a speaker if children are within hearing distance. Your package includes a version without brain entrainment to use in this case. I want you to be happy with our sessions. If you have listened, as instructed, to the CD's or MP3's and have not received the benefit you desired, please return the CD or contact me (if MP3) for a FULL refund within 90 days of purchase. Bear in mind that any change, to be effective, takes at least 21 days of daily reinforcement. You may notice a pulsing in the background music. This is part of the brain entrainment technology and is NOT a defect in the recordings. * Packaging may differ slightly from picture. Coren, S. (1996). Sleep thieves: An eye-opening exploration into the science and mysteries of sleep. New York: Free Press. Dement, W. C. (1999). The promise of sleep. New Yrok: Delacorte Press. Dinges, D. F., Pack, F., Williams, K., Gillen, K. A., Powell, J. W., Ott, G. E., Aptowicz, C., & Pack, A. I. (1997). Cumulative sleepiness, mood disturbance and psychomotor vigilance performance decrements during a week of sleep restricted to 4-5 hours per night. Sleep: Journal of Sleep Research & Sleep Medicine, Vol. 20, pp. 267-277. Dinges, D. F., Whitehouse, W. G., Orne, E. C., & Orne, M. T. (1988). The benefits of a nap during prolonged work and wakefulness. Work & Stress, Vol. 2, pp. 139-153. Hicks, G. J., Davis, J. W., & Hicks, R. A. (1998). Fatal alcohol-related traffic crashes increase subsequent to changes to and from daylight savings time. Perceptual & Motor Skills, Vol. 86, pp. 879-882. Jewett, M. E., Dijk, D-J., Kronauer, R. E., & Dinges, D. F. (1999). Dose-response relationship between sleep duration and human psychomotor vigilance and subjective alertness. Sleep: Journal of Sleep Research & Sleep Medicine, Vol. 22, pp. 171-179. Monk, T. H. (1991). Sleep, sleepiness and performance. Oxford, England: John Wiley & Sons. Moorcroft, W. H. (2003). Understanding sleep and dreaming. New York: Kluwer/Plenum. Spinweber, C. L., Johnson, L. C., & Chin, L. A. (1985). Disqualified and qualified poor sleepers: Subjective and objective variables. Health Psychology, Vol. 4, pp. 569-578.